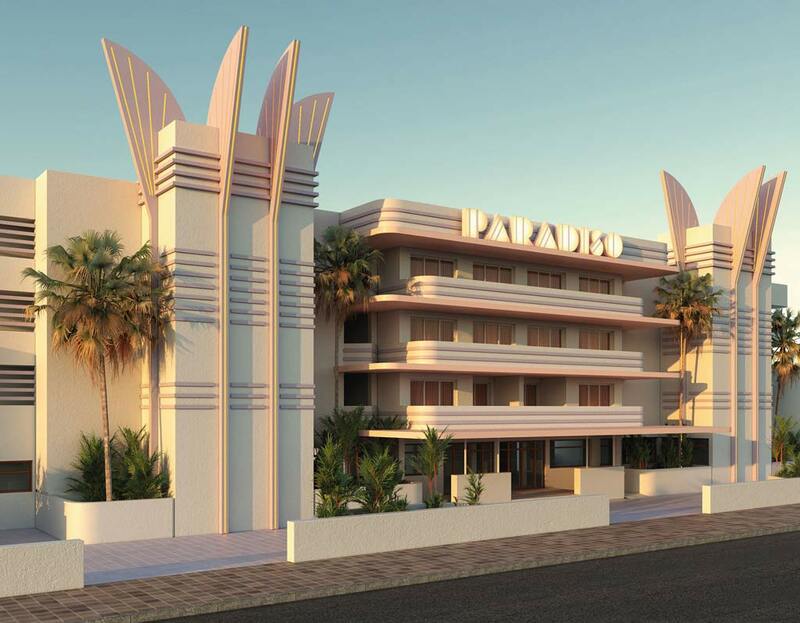 An impressive and super-stylish art deco makeover will transform Cala de Bou’s relatively humble Blue Star Apartments into the Paradiso Art Hotel for 2018. The Blue Star is currently in the ownership of the Playa Sol group who have 9 hotels in the Bay and around 40 throughout Ibiza. Though rated highly on Google for service and location, its rooms get a paltry 2.7/5, with guests complaining of the dated accommodation – ripe for a refurb. 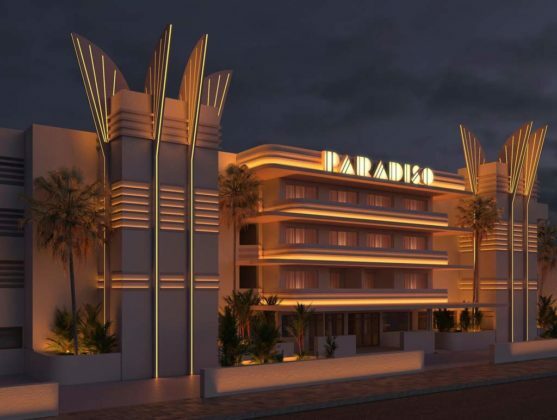 The Paradiso is marketed on their website as part of the Concept hotel group, who’s portfolio includes Dorado, Santos, Tropicana and the forthcoming Cubanito which is in a similar Art Deco style. Diego Calvo released images Monday 14th of August, announcing the hotel’s website was taking bookings for the 2018 season. 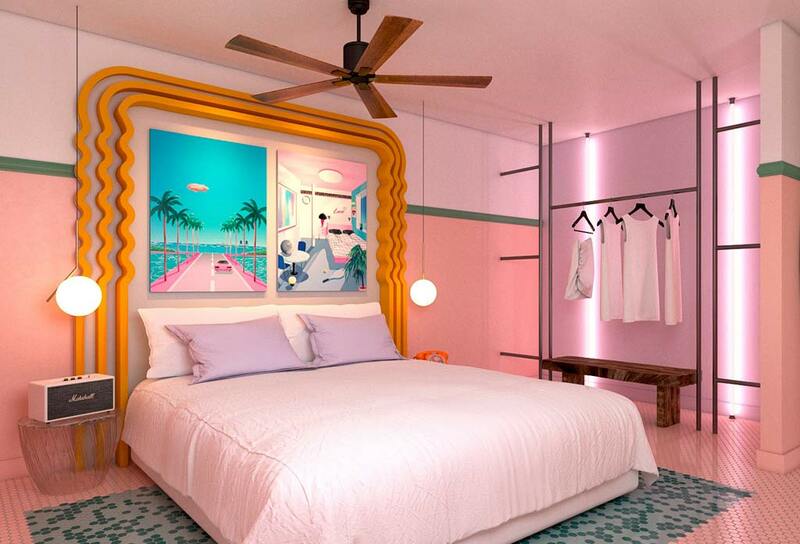 The Bubblegum meets Bakelite meets Bowie looks will bring a dash of Miami to the Bay. Though the lines could be 30’s, the added flash here and flare there give a 50s feel all about Cadillac and chrome. Interior design has touches from the minimalist movement born of European post war austerity, through to David Bowie’s dressing room with a few 21st century bits thrown in for good measure. 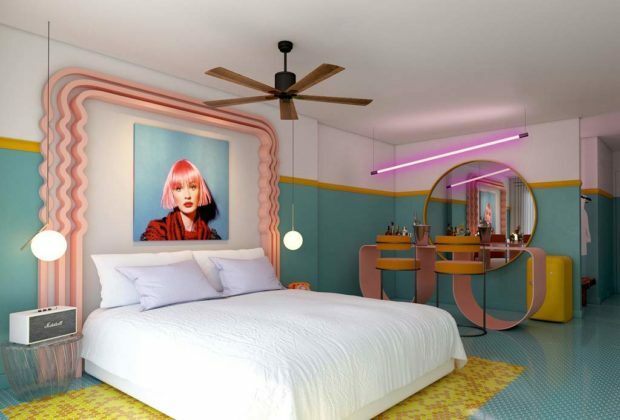 The rooms are all equipped with Smeg fridges, which is a predictable but welcome inclusion, and Marshall speakers – which speaks volumes (see what i did?) to their intended market. 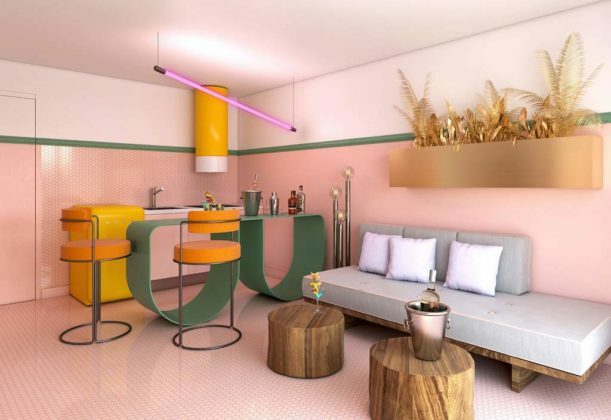 And the best feature of any hotel room, and shared with the in development Cubanito, every room has a bar. To me that is a welcome indication of looking at the guest in terms of what the guest wants, instead of the what they can extract from the guest – which would be far better served by getting people down to the pay bar. The overall result is retro without being retrospective, too stylish to be considered kitsch, but too kitsch to be taking itself too seriously. 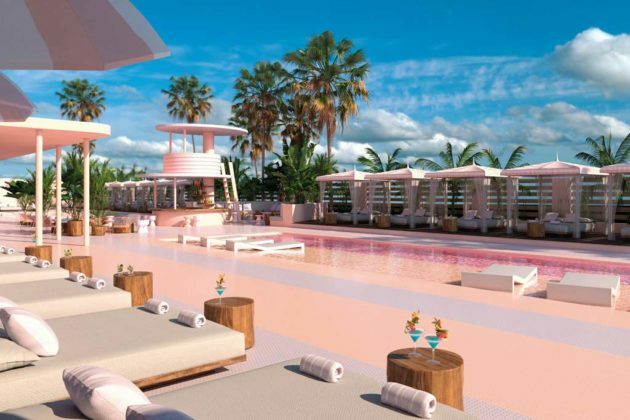 This is particularly evident around the pool where flamingo pink excess gives a feel of somewhere to have fun – something that is often missing in the clinical over-perfection of the designer hotels. The Paradiso is the fourth hotel in the Bay to go ‘cool’ in the last few years. 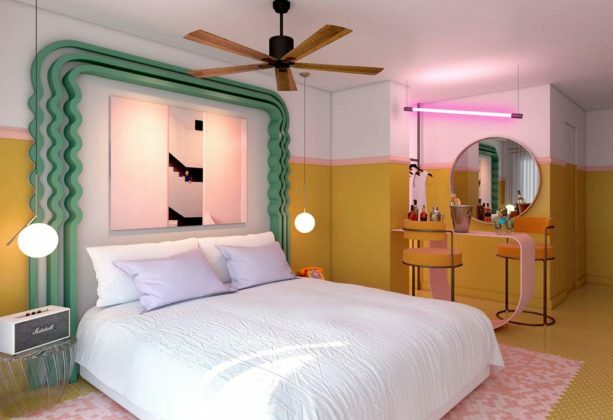 Their neighbours, the adult only Beach Star, have undertaken an excellent re-imagining. The multi-million renovation of the Pinet Play to the now Sol House by Ibiza Rocks with its rooftop pool bar. And the Axel group taking the Sundowner into their LGTB focused market. These are all a significant shift away from the Bay’s traditional family market. Whether they will reflect in an upturn in business for the bars and restaurants in the area only time will tell. 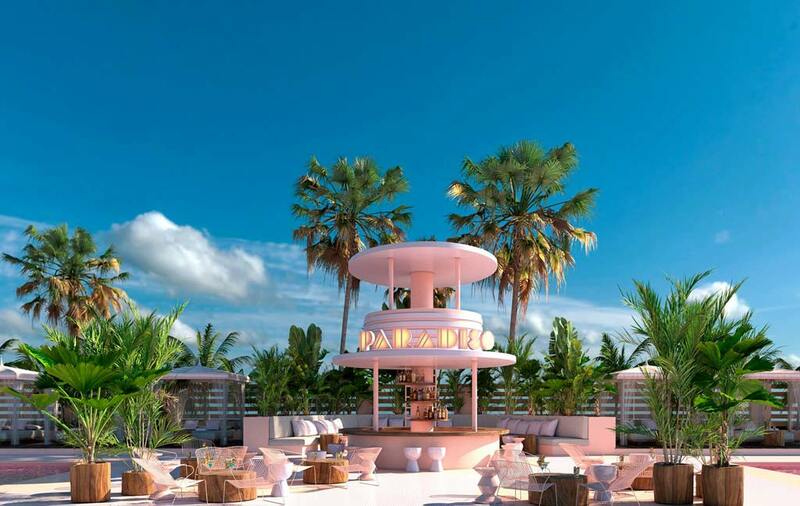 The young and connected market are known to buy and schedule much of their holiday in advance, with the majority of spend going into big venue ‘big days and nights’, with the interim using the comfort of the hotels. The hotel’s concierge services also give the impression these people will not be staying to explore the neighbourhood. Fair to say the website still has a few issues, not unusual in newly launched sites. Not least is that they have the address wrong and so acknowledge they can’t get a google maps fix on it. Shoot me down in flames if I’m wrong, but for their ‘Avenida Es Caló, 64-70, 07830, San Jose’ it should be ‘Carrer des Calo 64-70, 07829’ – close, but I guess google maps can’t cope with close. Links take you to all sorts of incorrect places, if they work at all, but you can forgive it all that because it all just looks so cool. 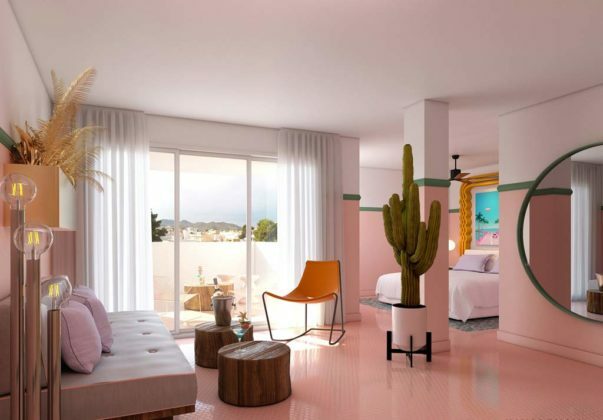 The website offers as yet unpriced comfort packages.